Our goal is to show genuine care and concern for each of our students and offer the support required to help them reach their goals and be successful. It continues to be a pleasure to serve Siksika Board of Education and the Siksika community and to reflect the values of the community we serve. 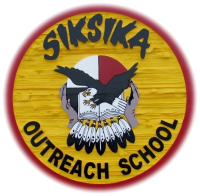 Siksika Outreach School is entering its 9th year of operation. We began our journey in a temporary portable with 13 students in October 2008 and moved into our new building with 105 students registered for our official grand opening in November 2011. At that time we had an official name change. The name changed reflected our substantial growth and the increasing support from numerous community partnerships to help meet the unique needs of our students and highlighted the importance of Siksika ways of knowing and the wisdom of our elders. The philosophies and practices from the Circle of Courage and the Seven Teachings of our Ancestors continue to be our foundational philosophies and what we choose to practice and to be accountable to. Among many goals of our school program, one is to rekindle the learning spirit of each of our students and develop capable and responsible learners proud of their identity, language, culture and their own achievements! Providing Alberta education curriculum, Siksika ways of knowing and personal and emotional support to students facing such obstacles takes a community. We are grateful for the partnerships we have formed and for the willingness of many community agencies and members to step forward and offer their expertise and guidance. We also look forward to welcoming more partnerships as more agencies and individuals are willing to support our program in a variety of meaningful ways. We can’t be more thankful. Our students are also grateful for such community support and for the opportunity to continue their education program in a learning environment offering individual programming, flexibility and support for many of the non academic issues they are faced with. As we continue to invite and accept the wisdom of our elders we look forward to further progress, additional student success and learning more. If you are interested in completing your Alberta high school diploma please contact me anytime to see if we can serve your needs. After an independent school evaluation our school has been named "Best Practice Site" for all of Alberta Outreach schools! Welcome to Siksika Outreach School...the little blue building with big expectations!